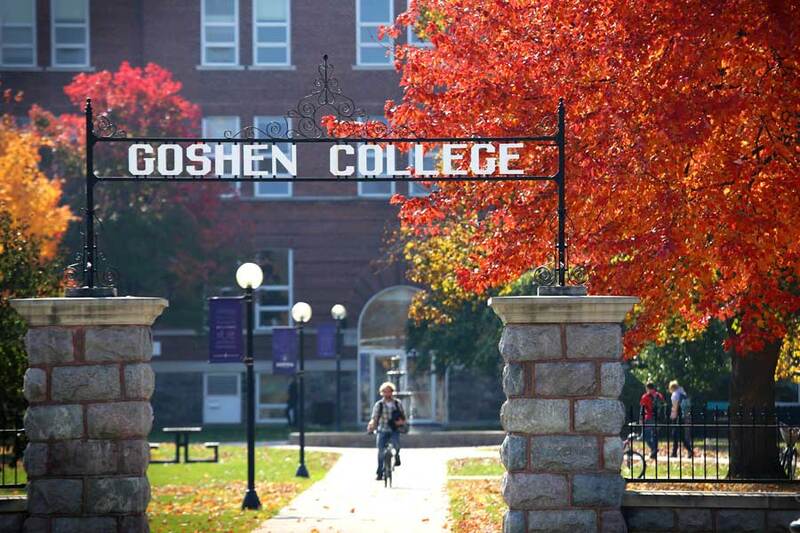 One of the nation’s top liberal arts schools, there’s no doubt that Goshen College is a great place to go to school. But for many Goshen residents, our hometown college is so much more than a top-notch academic institution, it’s a place to explore, connect, and play! With regular offerings in student art galleries, recitals, and athletic events –– plus guests lecturers, big-name performing acts, and plenty of on-campus amenities, there’s no shortage of ways community members and visitors alike can enjoy themselves at Goshen College. Here are just a few fun, family-friendly activities to explore campus! One way to check out what Goshen College has to offer is on foot (or two wheels!). A section of the city of Goshen’s expansive pedestrian path network winds through campus. One stretch extends from the Roman Gingerich Recreation-Fitness Center east to 15th Street and the Greencroft senior living facility. Another portion runs from the Rec-Fitness Center south to Bethany Christian High School. While strolling –– or rolling –– through, be sure to enjoy the natural beauty of Goshen College campus. Visit the lovely Schrock Plaza, get lost in the stacks of Good Library, or enjoy the tranquility of the historic Adelphian Fountain. You definitely won’t want to miss the vivid swaths of color and wonderfully surreal artistry of Goshen College’s tunnel mural, designed and painted by alumnus Noah Yoder (’10). Goshen College’s famously Maple-lined campus explodes in vibrant color every fall. 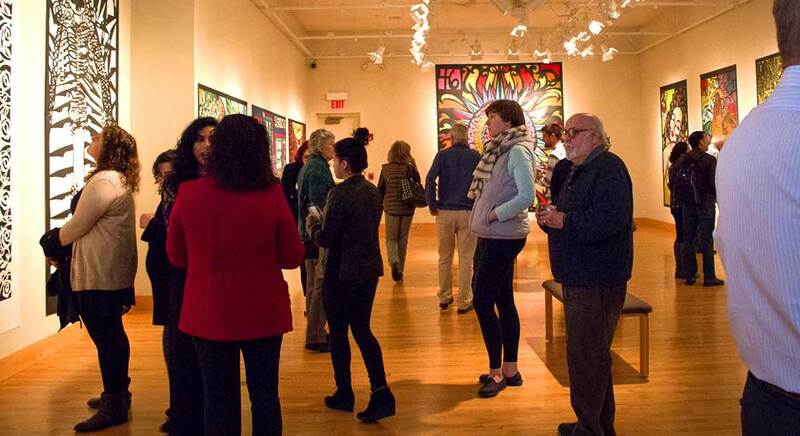 The Abner Hershberger Art Gallery, located in Goshen College Music Center, is home to a rotating showcase of fine art. Speaking of artistry, Goshen College is home to the Abner Hershberger Art Gallery, located in the Goshen College Music Center. The gallery is open from 9:30 a.m. to 4:30 p.m. weekdays, 1 to 4 p.m. Saturdays, and 2 to 4 p.m. Sundays (except during school vacations, of course!). Additional gallery hours are scheduled on concert dates. Looking for a fun night out and a way to support a good cause? Look no further than Goshen College’s International Student Club and its annual Coffeehouse event. 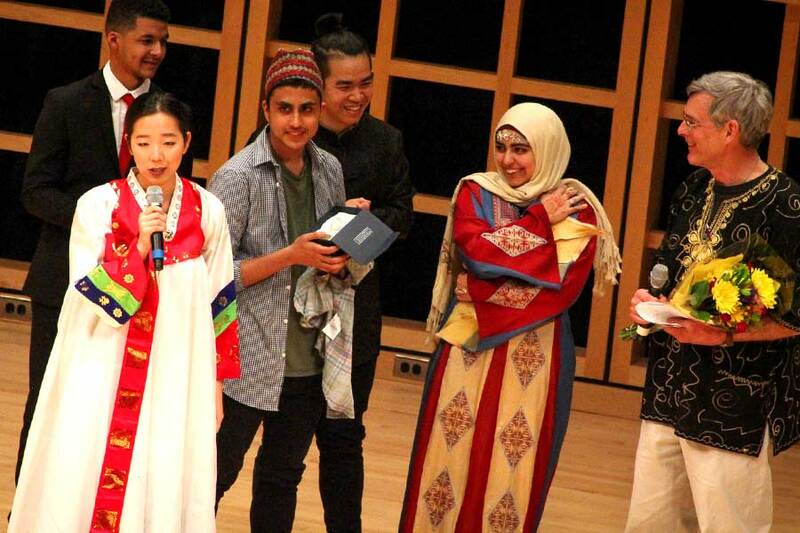 The annual – and quite joyous – event includes dinner, music, and dancing and showcases the cultures of GC’s international students representing more than 30 countries. The event serves as a fundraiser for international student scholarships and International Student Club events. Dona Park (GC ’17) addresses the audience at the 2017 International Student Coffee House. A child reads aloud to a student teacher. Dr. Mary Royer – “Aunt Mary” to many – taught at Goshen College for nearly 50 years. She is remembered for her warmth and graciousness, and her devotion to children. After she retired, Goshen College made sure her legacy would carry on by creating the Royer Reading Room. The Royer Reading Room is filled with the best of books for children. 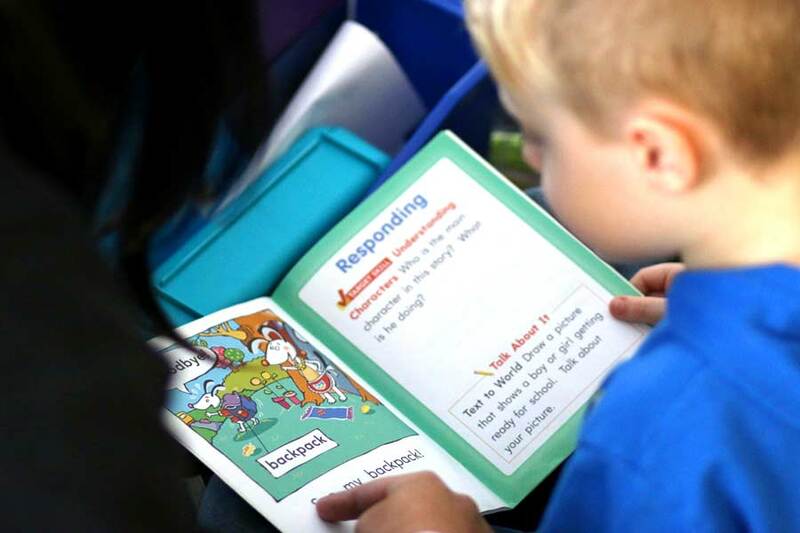 It’s both an educational resource and a fitting tribute to Royer, who specialized in reading and children’s literature. The Royer Reading Room is located in the lower level of the Harold and Wilma Good Library. 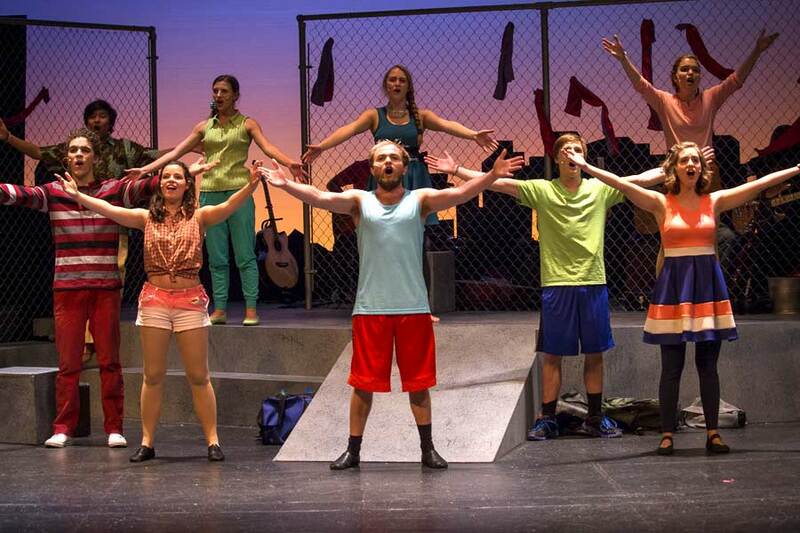 Students perform in “Godspell” in November, 2016. 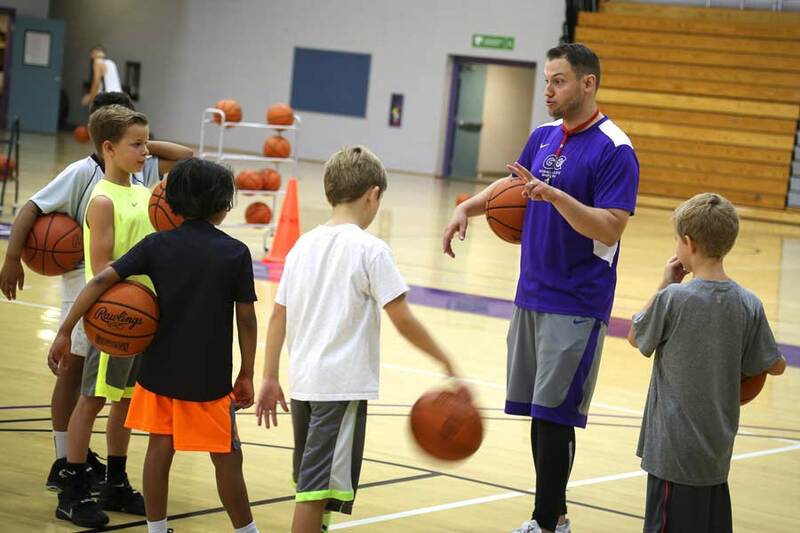 Little local athletes learning new skills at Goshen College’s summer basketball camp. Do your kids like sports? Music? Writing? Fantastic! Goshen College summer camps await. Children can have fun while they learn sports fundamentals at GC’s soccer, basketball, and volleyball camps. Through “Romancing the Code,” they can learn how to program code and write poetry at the same time. Do you have a future potter on your hands? At 3D Art Day Camp, he or she can learn to work with clay. Additionally, the GC Communication Department offers the Write on Sports program for middle-school students. Students at the camp learn the basics of good journalism and apply their knowledge to writing sports stories and creating videos. The program is a GC partnership with Write on Sports and Goshen Community Schools. Young or old, musicians of all skill levels are invited to take part in the Goshen College’s Community School of the Arts. Private and group lessons are part of the CSA offerings, as are ensembles and an adult orchestra. Goshen College also offers a Music Together program, with classes held at the Music Center. Music Together is an internationally recognized music and movement program for children up to 7 years old and their parents or caregivers. 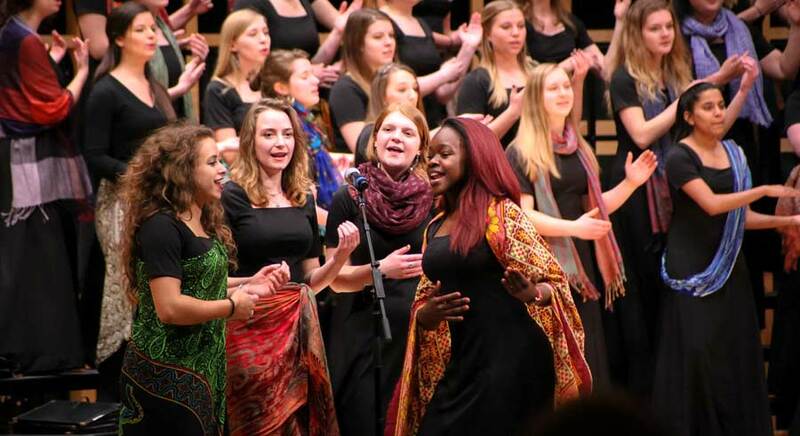 Soloists Clara Elizabeth Woodworth (GC ’17) and Achieng Agutu (GC ’18) perform with the Goshen College Women’s World Choir. 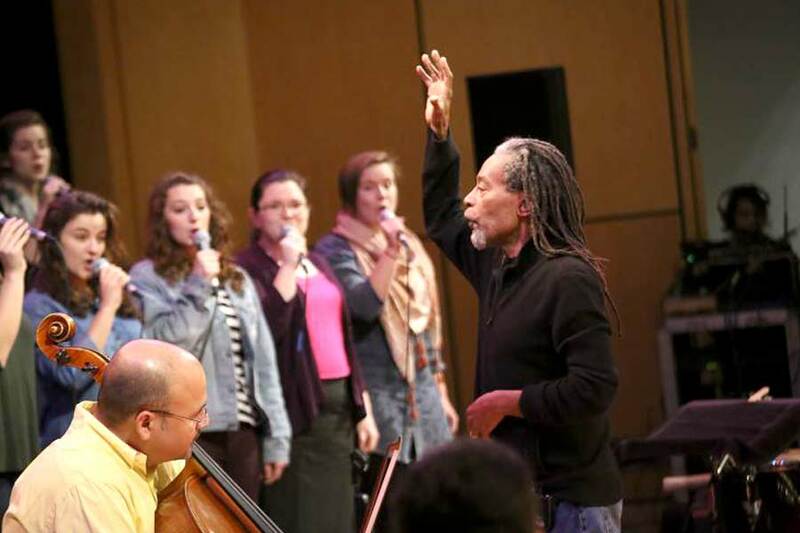 Ten-time Grammy Award-winner Bobby McFerrin rehearsed with Goshen College Chamber Choir before a Valentine’s Day concert in 2016. Sauder Hall is also a showcase for a beloved yuletide tradition, “A Festival of Carols.” The holiday music showcase includes performances by the Goshen College Choirs and Goshen College Symphony Orchestra. Not on the GC campus but well worth the drive is the college’s Merry Lea Environmental Learning Center. Open to visitors, Merry Lea is a nature sanctuary near Wolf Lake. Most of the habitats that can be found in northeastern Indiana are present on the sanctuary’s 1,189 acres. The Merry Lea landscape also includes the geological features of peat bogs, a marl pit, and glacial gravel formations. 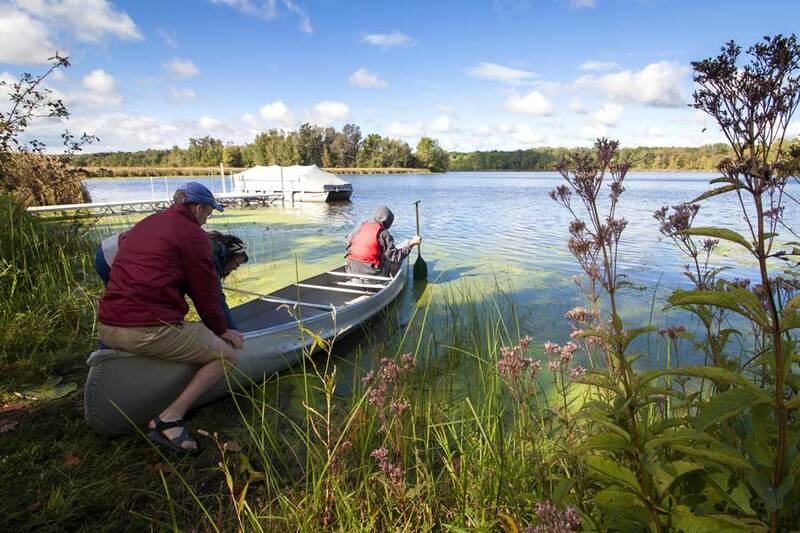 Canoers launch onto a pond at Merry Lea Environmental Learning Center of Goshen College in Wolf Lake, Indiana. 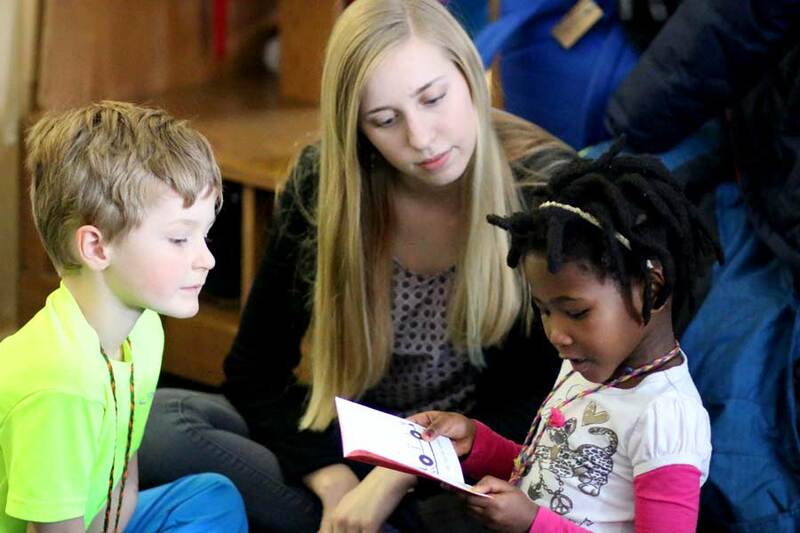 Children read with a student teacher at the Campus Center for Young Children located in the College Mennonite Church. Goshen College provides a nurturing environment for kids at its main campus, too. The Campus Center for Young Children is a licensed child care facility located in the College Mennonite Church building, and is accredited by the National Association for the Education of Young Children. Open from 7 a.m. to 5:30 p.m. Monday through Friday, CCYC enrolls children ages 13 months to 5 years old. Also, youngsters and student teachers learn together at GC’s laboratory kindergarten, a partnership between the Goshen College Education Department and Goshen Community Schools. GC education students gain valuable teaching experience, and the low student/adult ratios mean kindergartners receive individual attention and guidance. Feel like watching sports, but not on TV? You’re in luck. GC athletic teams compete right here in Goshen, and big crowds add to the excitement! Goshen College sports feature young athletes at the top of their game, every game. Be it baseball, basketball, soccer, or cross country, GC players are giving it their all. And all they need is for you to cheer them on! 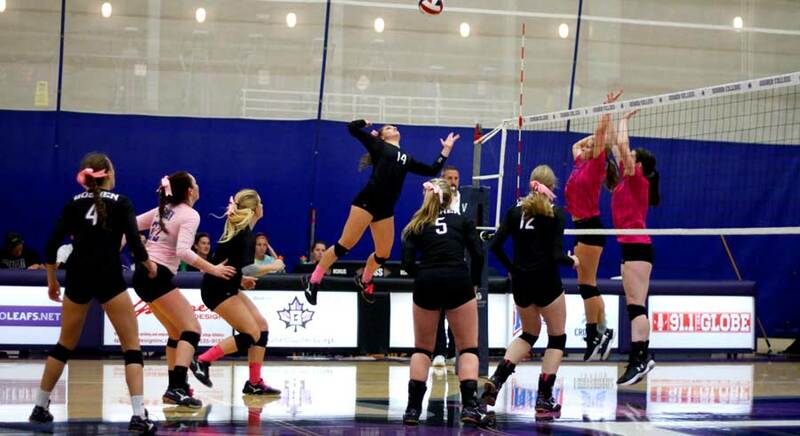 Goshen College women’s volleyball player prepares to spike against an opposing team.